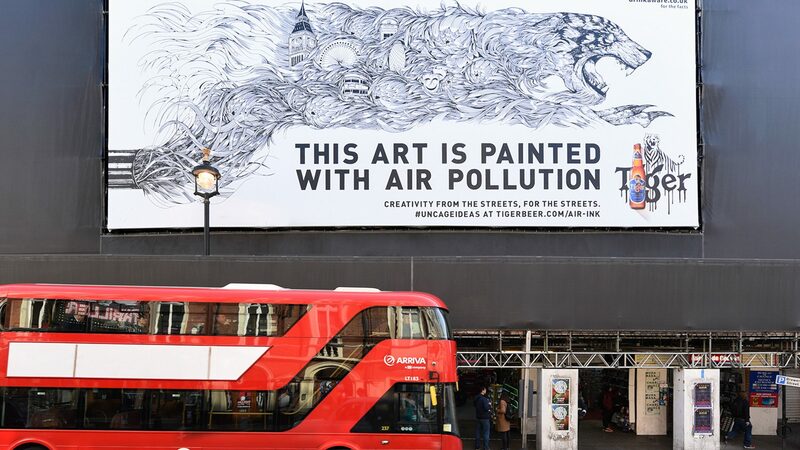 Pop-up global art project turns air pollution into street art from London to New York City in honor of Earth day. 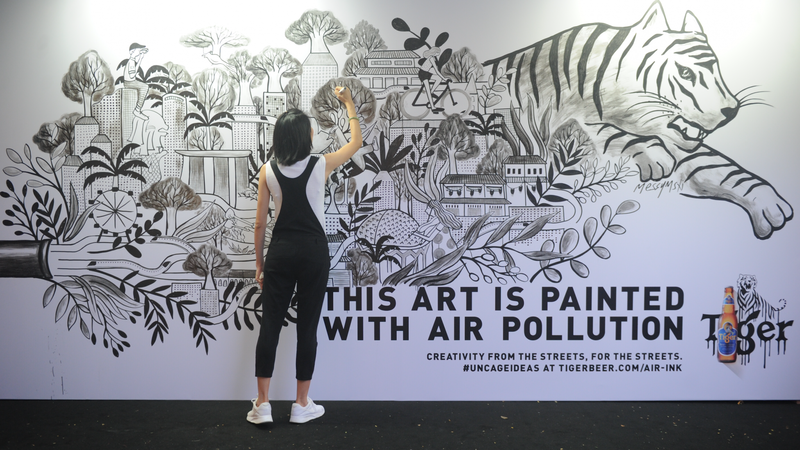 Air pollution has never been associated with beautifying a city, but that notion is about to change, albeit in a small, artistic way. 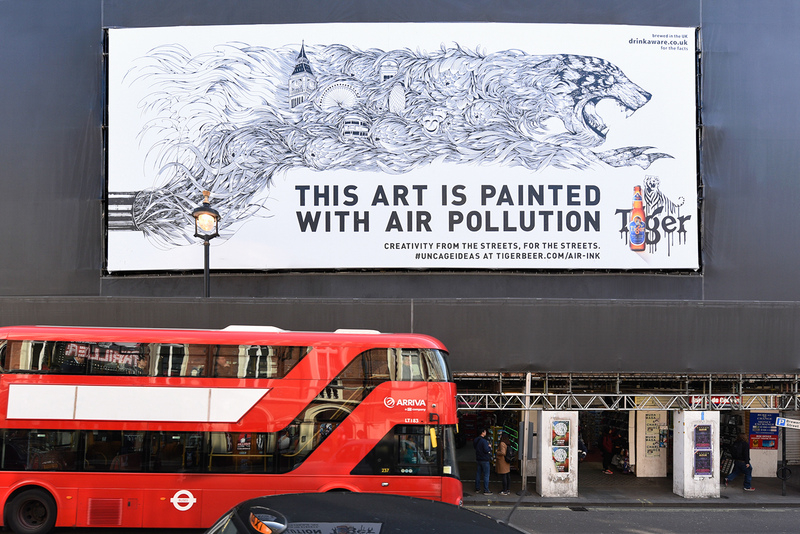 Thanks to a project by a group of international artists, their sponsor Tiger Beer, and the ingenuity of Graviky Labs’ co-founder Anirudh Sharma, public spaces in Singapore, New York, Berlin, and London will feature creative murals and canvases painted with ink derived from smog. 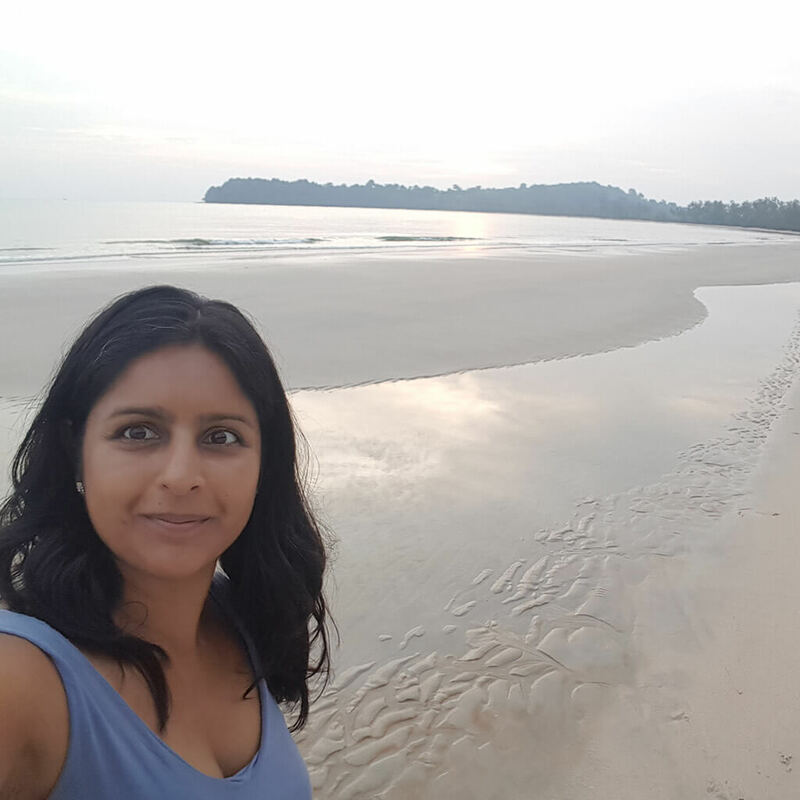 This is made possible by Air-Ink, Sharma’s invention born out of the MIT Media Lab, in which carbon emissions are collected, purified, and converted to a rich, water-resistant black ink that can be used in pens, markers, and screen printing. A 30 ml bottle of Air Ink negates 45 minutes of pollution, collected from a car exhaust pipe. After a successful Air-Ink pilot art project in Hong Kong last year, Sharma’s brainchild is now in the hands of renowned artists such as Buff Monster, KristopherH, MessyMsxi, and Die Dixons, who revealed pieces in New York’s Chelsea (28th St. & 7th Ave.), London’s Shaftsbury Avenue, Singapore’s Orchard Gateway, and the streets of Berlin respectively. 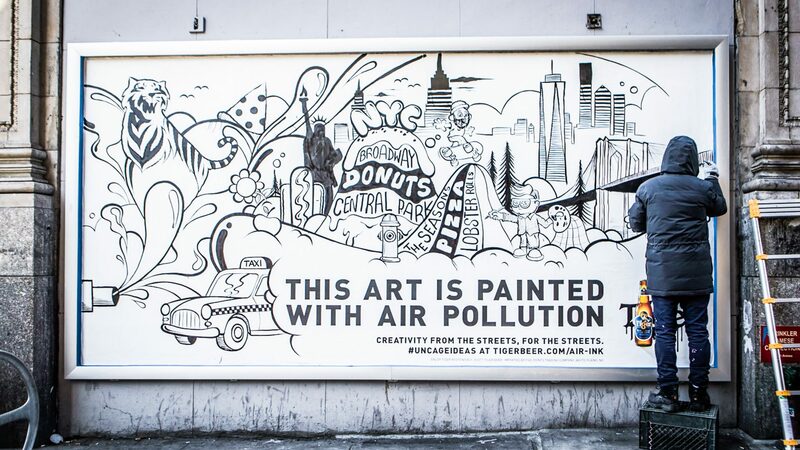 Along with other emerging artists, their public exhibitions expand into art galleries, bars, window displays, and other venues where urban art is appreciated, appropriately throughout the duration of April—the month of Earth Day. 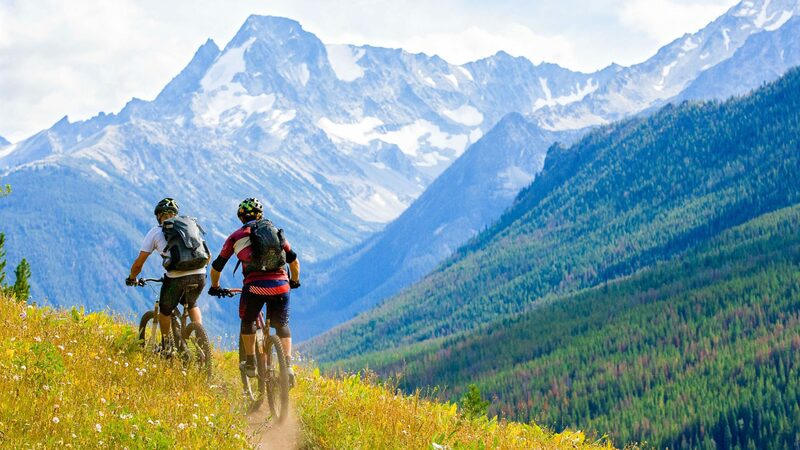 No plans to travel to one of these cities this spring? 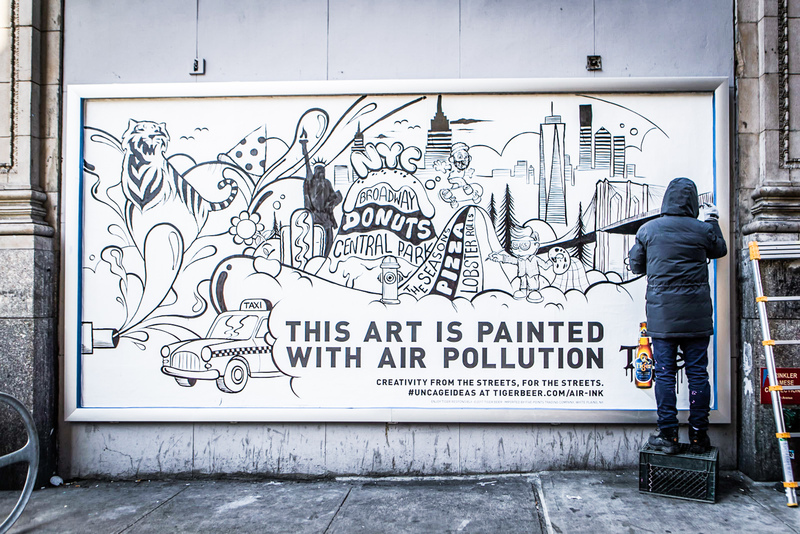 Perhaps Air-Ink murals will come to an urban public space near you when Sharma’s already-funded Kickstarter starts distribution of the product this summer. In addition to the exhibitions mentioned above, other Air-Ink art pieces can be viewed at Buff Monster’s show at the Clean Art Gallery at Senaspace Gallery in New York’s Soho district (229 Centre St.) from April 22 (Earth Day) through May 1. Pieces by Anthony Chong, who goes by the street name Antz, are featured in Singapore’s Acid Bar (180 Orchard Rd.) through April 30. A collective show throughout the month of April can viewed in Berlin’s Urban Spree Art Gallery (Revaler Str. 99), which includes artists Rylsee, Steffen Seeger, Gogoplata, Kera1, Cren & Akte One, and Andrea Wan.